There is a story behind kites being seen in the air throughout the Rocinha Favelas and this is where the inspiration came from for the ceiling. 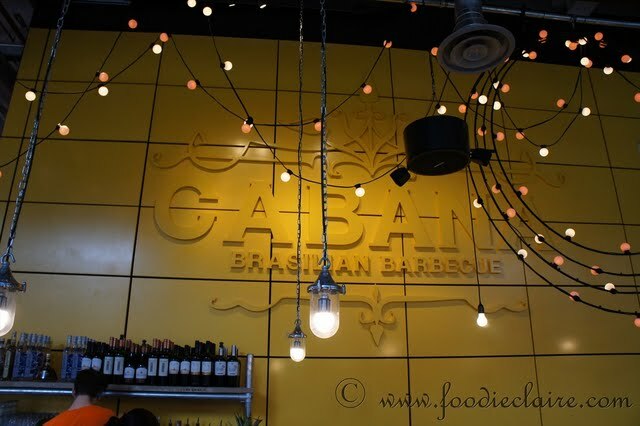 Cabana is a fairly new concept of a small restaurant chain that opened late last year. 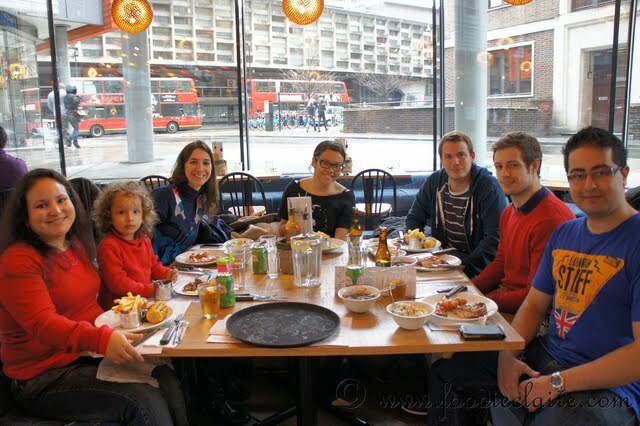 For those that have been to Brazil or Brazilian style restaurants over here you might think of Rodizio Rico. 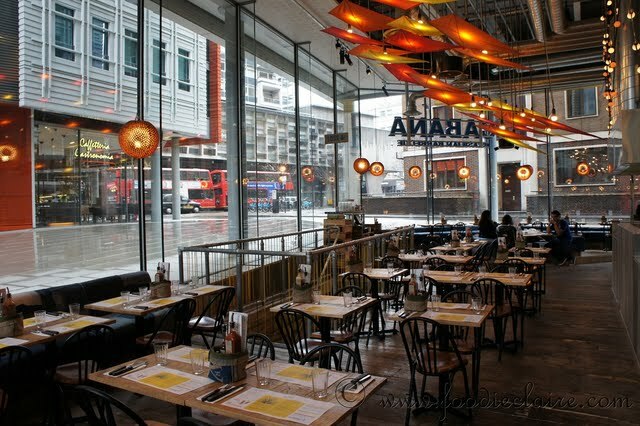 This restaurant isn’t a Churrascaria style eatery. The quality of food is actually a lot more luxurious. They offer lobster tails, prawns, cassava chips and much more. I put my name on the tasters list a while ago when I was approached and had been waiting patiently for my calling. I think poor Lizzy was fed up of me pestering her to find out when the tasting would be. Saturday’s event was lovely. A few people didn’t turn up. Probably due to the horrible rain we’d had for the first part of the day. Or possibly because this event fell on St Patrick’s Day. Either way I didn’t mind. There ended up being 6 of us plus one of the guest’s children. A nice little group. 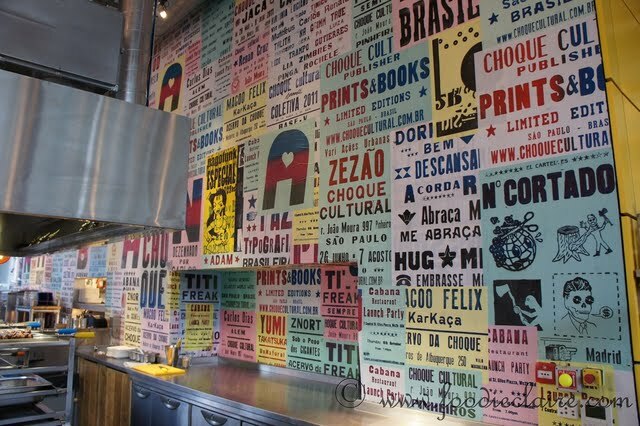 A great mix of cultures too as one of the diners is a native Brazilian, a Peruvian and a well travelled diner. We talked a lot about the food we’d had, restaurants we’d been to. Where was/wasn’t authentic. We even exchanged contact details with the assurance that we hope to meet up in the future. So back to the food. Before ordering I started off with a Caipirinha. 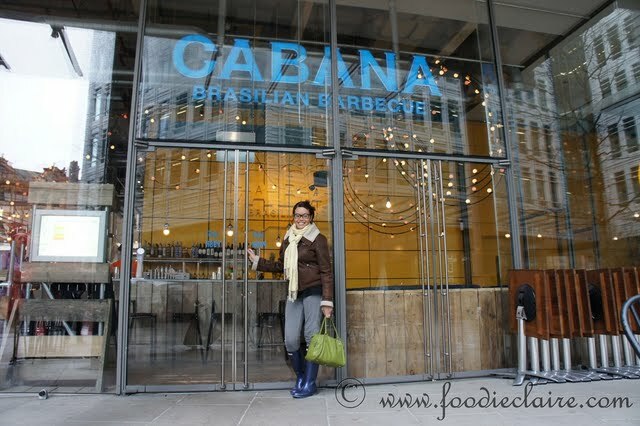 If I think it might possibly be made well, I like to try caipirinhas in London. 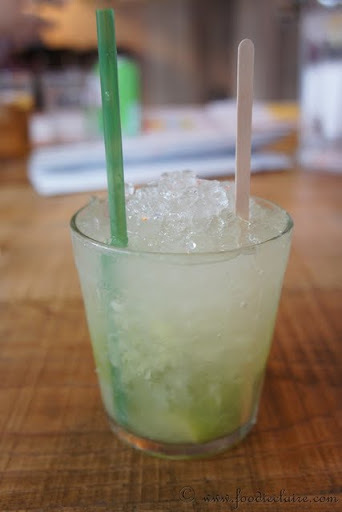 Of course nothing could ever match the caipirinhas I had in Rio. I’m yet to find a restaurant in London that will put a whole lime in each drink, but it wasn’t a bad effort. 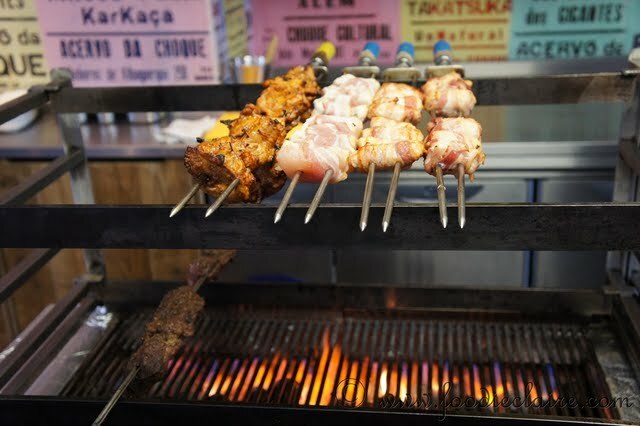 Better than Rodizio Rico, but that wasn’t hard. Ok, now back to the food (really). As I mentioned before we were here to try the combos. A fairly new addition to the menu where you could order a one dish meal that would have a fair selection of meat, some sort of fries and a vegetable. The native Brazilian Aline kind of made my decision before I’d had a chance to consider the others. Rightly so though as she said the sausages in the dish “Ola” which contained papaya were amazing. The thought of sausages with papaya did sound promising. Savoury pork sausages with the sweetness of papaya. I was sold. 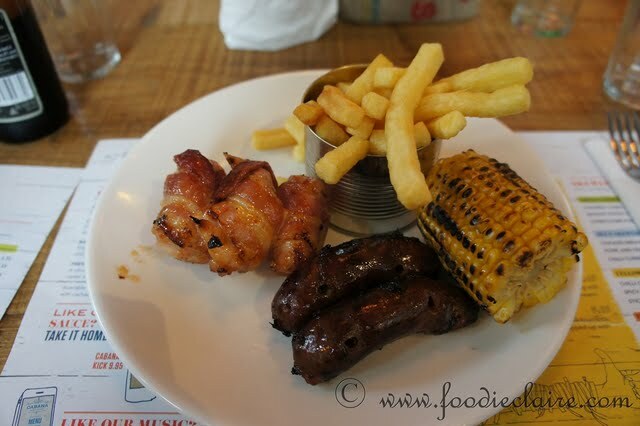 This dish also had chicken wrapped in pork, hand cut fries and corn on the cob. 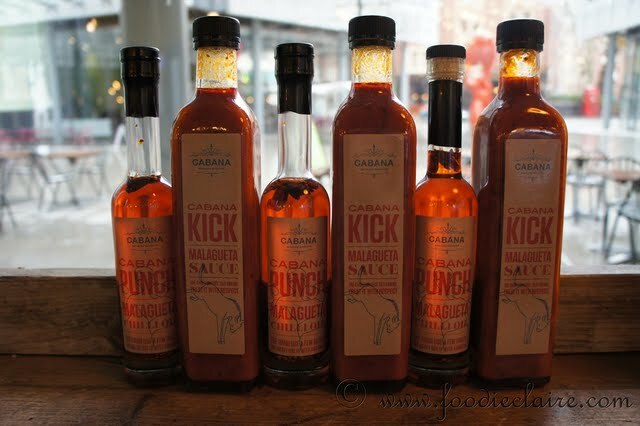 Sauces on offer at Cabana Brasilian restaurant. Malagueta you must try! Completely stuffed and topped up with caipirinhas, the waitress offered us dessert menus. As much as I wanted dessert (on this rare occasion), I knew I couldn’t possibly manage it. Especially when I was supposed to be fitting into a bridesmaids dress later that day for one final fitting. Aline and Alexandra commented that they had tried the cheesecake before and it wasn’t that great. Shame as that was the one thing I would have had. They also had “froyo” on offer (frozen yoghurt). A choice Amardeep went for with crushed peanuts on top. It looked amazing and I am sure I would have liked it, but I was so stuffed from pork all I could hope for was getting into my dress later that day. 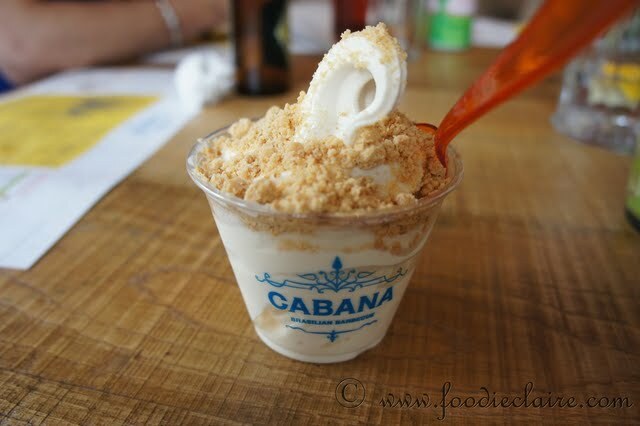 As tempting as this dessert at Cabana looked, I had to refrain as I was simply too full! 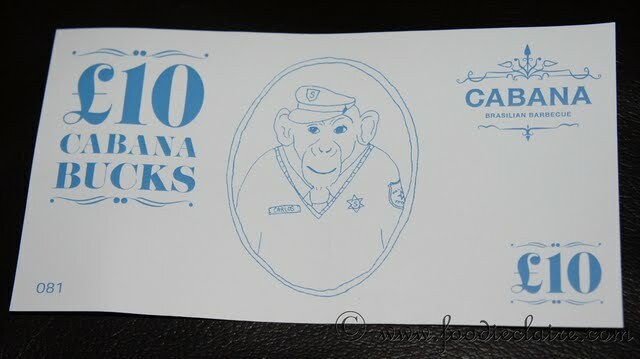 Thanks to Lizzy for organisation, Claudia, Winona and all at Cabana for hospitality and the kind gift voucher for future use. I work very close to St Giles so only hope to visit in the future for lunch or dinner.